Hello everyone! This week, you will see a post from me every day Monday through Friday. I don't believe that has ever happened -- LOL! The reason is because I am the Growing in Unity Gal this week. (Unity has 52 people post for a week through the year) It's very exciting for me and could be for you too. Unity Stamp Company has the most awesome red rubber stamps and always has great sales each week too. I will be picking two names from all my posts this week and each person will win 25 random Unity Stamps! 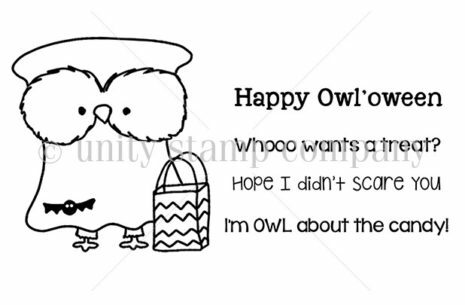 Since today is Halloween, I decided to use this adorable owl and sentiment from the Happy Owl'oween set. You will likely see several owls this week as I love and buy them all since my university's mascot is an owl. I colored my owl with Zig Clean Color markers. Additionally, I used Recollections paper and spiderweb diecut shape, and some fun Creamy Pumpkin Trendy Twine. The orange spiderweb is very shiny so it was hard to photograph. This was an easy owl to color since he's in a ghost costume! Finally, since today is also my birthday, I would like to give away an extra Unity Stamp set from my stash. I will draw a name from today's post and send the Maggie Girl Angie Girl Unity Stamp. (this is from my own personal stash and not from Unity). Please stop back every day so that you have a chance to win 25 stamps!! Happy, happy birthday, Helen! May it be a day filled with great things for you! How cool is it that you are the GIU gal during your birthday week :) You card is so adorable! I love it. Happy Birthday - hope your day is just fabulous! Your card is adorable. I love all birdies and the owl is one of my favorites. Love the design with that spooky fun spider web. Happy Halloween! Love your card. I love Unity stamps also but i am more partial to the girls. It is always fun to see others creations. Can't wait to see what you do for the rest of the week. Happy, Happy Birthday to you Helen! !Congrats to you too! I absolutely love the Halloween owl! !Super cute card my friend! Adorable card :) The shiney web is a great touch. HaPpY BiRtHdAy !! !! Congratulations on being the GIU girl this week ~ can't wait to see all you have in store for us !! So owl-dorable! I just got this cutie and cant wait to ink him up! Happy birthday! Hope you had a happy birthday. Love the spider web and this adorable owl! love your card and that sparkly spider web! I've never added color behind words. What a nice idea. So cute--love owls. Happy belated birthday! This is a super fun card, made with the adorable big eyed owl! Perfect for a Halloween day card! Love it! Hope you did something super cool for your birthday! Happy belated birthday. Hope it was great. Owl really like your card. Love Unity owls. Hope you had a fabulous birthday. Love the owl he is so cute. Happy Belated Birthday! 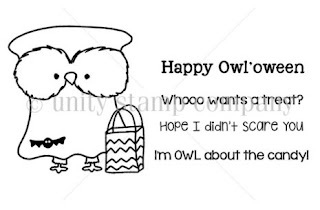 Cute owl card!! Darling Halloween card! Love that adorable owl! Very sweet card. Love the owl. Congrats on being the GIU girl!! Such a lovely card!! Very cute card,love the spiderweb that just sets the little owl off.